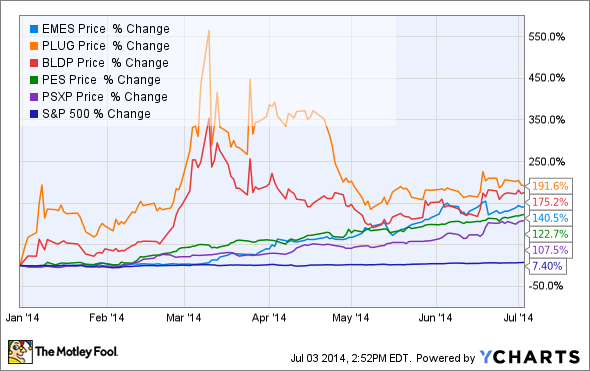 Can these energy companies maintain this momentum through the rest of 2014? Or are they just a flash in the pan? Don't look now, but we're already halfway through 2014, and so far it's been the year of energy in the world of investing. In 2014, the S&P Energy index has nearly doubled the broader market, second only to utilities (then again, utilities and energy so seem an awful lot alike). There have been some real standouts, but none has quite reached the highs of Phillips 66 Partners (NYSE:PSXP), Pioneer Energy Services (NYSE:PES), Emerge Energy Services (NYSE:EMES), Ballard Power Systems (NASDAQ:BLDP), and Plug Power (NASDAQ:PLUG), which are so far the best-performing energy stocks this year. Let's look at what has happened at these five and whether they can keep it up over the rest of the year. Whoever decided to spin off Phillips 66 from ConcoPhillips, and then spin Phillips 66 Partners from that, should get a pat on the back, because there are few things in the energy space that have unlocked so much value from a single company in the past couple of years. For a master limited partnership, though, its distribution yield of only 1.4% is rather paltry in comparison with the rest of the space. Between now and 2017, though, Phillips 66, the general partner, plans on dropping down $1.5 billion in assets, which will significantly grow the distribution. If all of those dropdowns were to happen at an EBITDA multiple of 10, this could potentially increase distributable cash flow by more than 150% over that time frame. A major question about those dropdowns will be how the company plans to finance them, because if it issues loads of new shares to make it happen it might not significantly increase the distribution to each share. If it can grow without needing to tap the equity market too much, though, Phillips 66 Partners could see that 1.4% yield tick up significantly. You'll be hard pressed to find a company that sees shares increase by 120% as quietly as Pioneer Energy Services has over these past six months. With its large fleet of drilling rigs and servicing rigs for projects such as hydraulic fracturing, Pioneer suffered mightily after natural gas prices started to plummet, oil services companies got better at fracking jobs, and producers wound down drilling and fracking activity in natural gas-heavy regions. Since then, though, the company has focused its rigs to be most active in the three major shale oil formations: the Bakken, the Permian, and the Eagle Ford shale. With activity in these parts of the country going gangbusters, it's no surprise that activity at Pioneer has picked up. With the company's rigs now running at a breakneck pace (its well servicing unit has recorded a utilization rate of 102%), the next question is whether the company can start to clean up its balance sheet and increase its dayrates for services to increase margins. As more and more companies retire legacy rigs and newer, high-spec rigs like Pioneer's become the only players in town, it is possible. Emerge Energy services has seemed to find the pulse of the shale boom. As a manufacturer of sand used as proppant for oil and gas drilling, it has tapped into the only thing in the energy industry that is growing faster than oil production itself. Oil and gas producers are finding that adding more sand proppant per well can significantly increase overall yields from shale wells, and so each fracking job is using more and more sand. Between 2013 and 2014, the average amount of sand used per frack job has gone from 2,500 tons per well to 8,000 tons. Combine that with the increasing amount of total completed wells in the past couple of years, and demand for sand is absolutely immense. With Emerge slated to start operations at two new mines in 2015, it will become the nation's largest producer of sand proppant in the United States. For a company that is a variable-rate master limited partnership -- meaning that its distribution changes over time based on how much distributable cash flow it brings in per quarter -- this could lead to even larger gains this year. Some people may argue that Ballard and other fuel-cell manufacturers aren't energy companies, but considering they're all looking to change the way we use and produce energy, we'll give them the benefit of the doubt. After years and years of trying to develop a commercially viable product that could compete with other energy storage and generation options, Ballard Power Systems and other fuel-cell manufacturers are the closest they've ever been to be competitive. So when orders started coming in at Plug Power -- which has been using Ballard's fuel-cell stacks in its battery replacement fuel-cell systems -- the frenzy to get shares in fuel-cell companies took off. Of the companies involved in the manufacture of fuel cells, for whatever purpose, Ballard is far and away the closest to being a profitable company. However, it will still take some pretty significant sales growth numbers before that will happen. If it can do this, though, it may be still have a chance to climb even higher than where shares are today. If we had looked at the best performing stocks back in March, barely anyone could have come close to Plug Power when it was up over 550%. Much of that euphoria has been centered on a couple of deals, the largest of which came from Wal-Mart back in February, when it ordered more than 1,700 fuel-cell units from Plug Power. Since that time, though, the company has slowly seen share prices dip from two equity issuances and earnings reports that haven't quite lived up to the hype generated by those deals. The most important aspect of the company that does give promise is the company's $80 million backlog in orders and growing, which is close to triple what it had on the books less than a year ago. The company expects to break even on an EBITDA basis some time later this year, but it has some work to do to grow sales and increase margins before it can get there.